Rosselli (Rosselli & Castellazzi, later Fabbrica Automobili e Motori, Ing. E. di A. Rosselli) is a historic brand of motorcycles located in Torino. This was one of the first Italian motor factories. 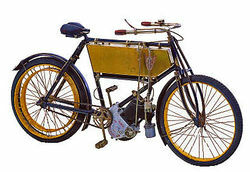 The first product was the Lillyput bike with a 1 hp motor, followed by a full race and touring versions with a 1 ½ hp engine in 1902. In 1903. Rosselli then developed a 258 cc 2 ½ hp engine and made a ladies model with a reduced size frame.